1. Wash long green beans, cut both ends, and cut into 1” length. 2. Put cut long green beans in a microwave (or scald in boiled water) for 2 minutes, shock with cold water, drain and set aside. 3. Wash streaky pork, pat dry, and cut into pieces. 4. Wash kaffir lime leaves, tear in halves, remove central stems, and finely slice. 5. Heat on in a wok on medium-high heat. 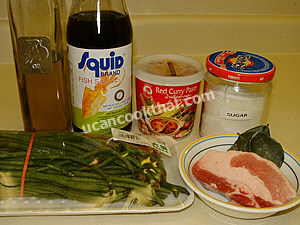 When oil is hot, add red curry paste, stir-fry until fragrant and oily, then add cut streaky pork. 6. Stir-fry until the pork is getting cook, season with fish sauce and sugar, and stir-fry until all ingredients mix together. 7. Add long green bean, stir-fry quickly to mix well, add finely sliced kaffir lime leaves and continue stir-fry for 30 seconds, then remove from heat. 8. Place the stir-fried pork with red curry and long green bean on a plate, top with finely sliced kaffir lime leaves and serve immediately. 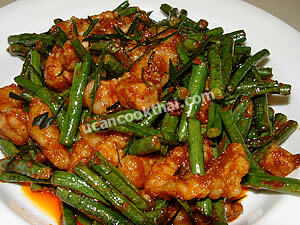 Tip: Shocking cooked long green beans with cold water will leave fresh taste after stir-fry them.